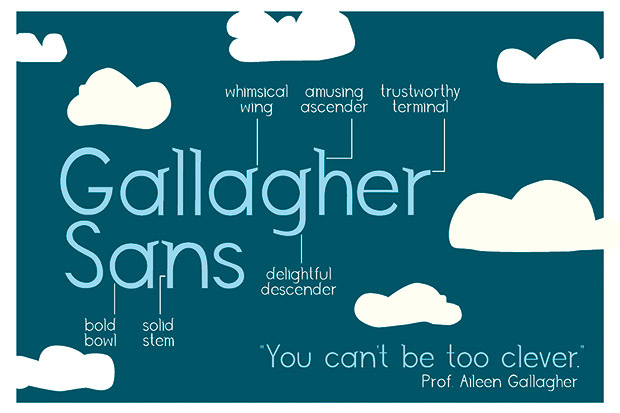 Gallagher Sans was designed by student Eliza Hsu Chen to reflect the characteristics of Assistant Professor of Communications Aileen Gallagher. Graphic design students in the Newhouse School have looked to professors as unconventional sources of inspiration for their latest project. The project, titled “Characters,” required each student to learn about a Newhouse professor by observing his or her class or conducting one-on-one interviews. The students then used their findings to create typefaces, which are still in development. The most recent versions of the projects are on display in the Newhouse 1 lobby. 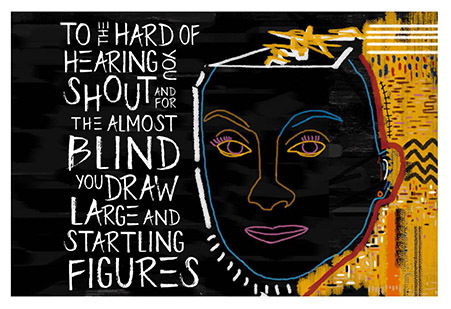 The project is part of GRA 437, a typographic design course taught by adjunct professor Claudia Strong. Strong assigned the project for the second time this year, based on the success of last year’s typefaces. “It was such a huge hit that we had professors asking me if they could please get a typeface made,” Strong says. Her intent is to continue the project until every full-time professor at Newhouse has a typeface created for them. Student Sara Wong designed this typeface to reflect Professor and Department Chair of Public Communications Melissa Chessher. Professors will receive posters and downloadable files of their typefaces once students have made their finishing touches.